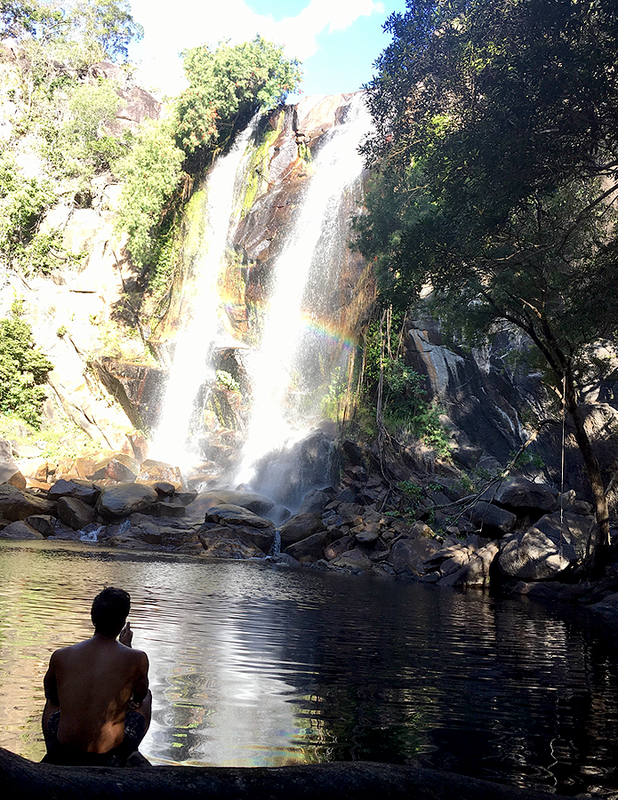 Trevethan Falls was my first waterfall in Australia! Throughout Queensland, a lot of the beaches and rivers are infested with saltie crocs so you can’t swim and need to be alert just to approach the waterfront. So anytime you find a croc-free water source, you have to get in! Trevethan Falls: pretty & cold. At Trevethan be prepared to jump right in because the water is cold, cold, cold. I made the mistake of trying to wade in on the rocks at the surface and it was miserable. It took me a solid five minutes to get all the way in. I would have been better off jumping in from the surrounding boulders. We visited in the middle of the winter season, but I doubt the water gets much warmer even during the summer. 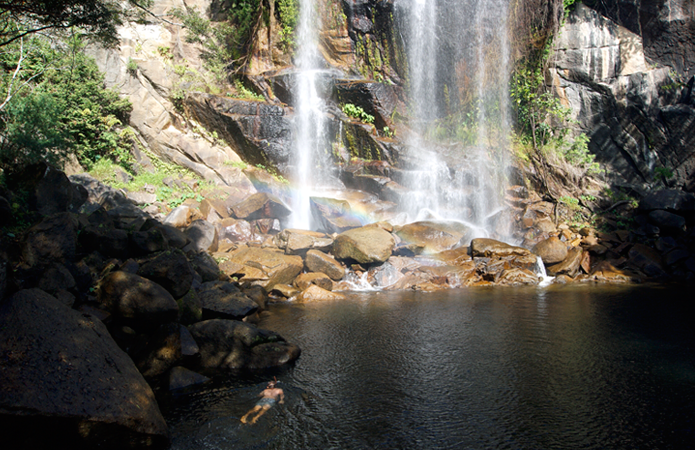 The falls and swimming hole are surrounded by trees and get limited sunlight during the day. Be sure to test out the rope swing on the right side of the falls. The locals got quite the show when I tried to climb up the submerged rocks to the rope swing. I got halfway up, slipped, and then slid down the rocks and back into the pool… numerous times. John eventually had to climb up and grab the rope so I could pull myself up. And of course, everyone else seemed to manage the climb just fine. I spy a rope swing. 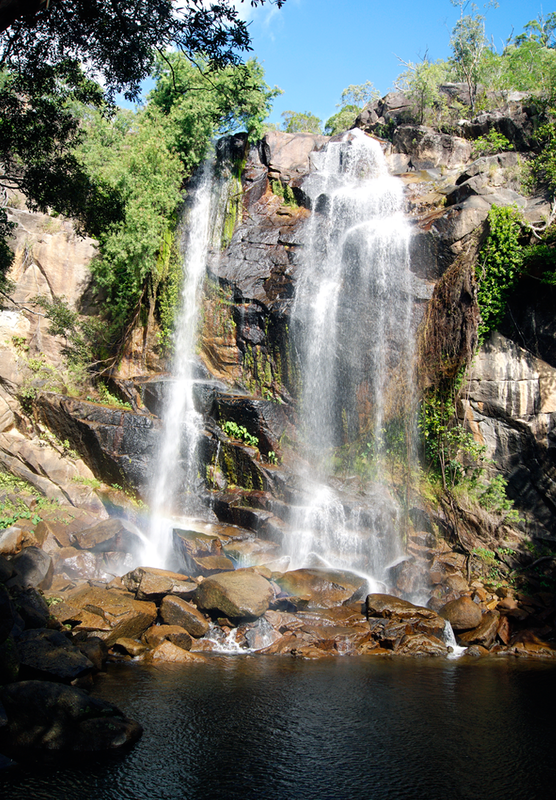 The falls are about 15 minutes south of Cooktown and off the beaten path. Driving down the Mulligan Highway, take the Amos Bay turn and follow the makeshift signs. Keep your eyes peeled for trees spray-painted with “falls” and an arrow… I wish that were a joke. The more sensible advice: take a local! There’s a pretty decent dirt patch when you arrive that you’ll assume is a parking lot. When you find that, you’ll know you’re there. The dirt road ends there so you’re out of options anyways. After parking it’s a quick two-minute walk up and down a hill into the falls, follow the worn dirt path and enjoy! I'm Blonde! And my goal in life is to see the entire world. 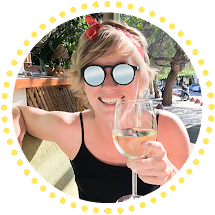 But I don't want to just travel, I want to live life as a global citizen - truly understanding and belonging to the places I visit, as if I was a local. Follow along as I take a self-imposed sabbatical, getting fully immersed in the Oceania culture and way of life.